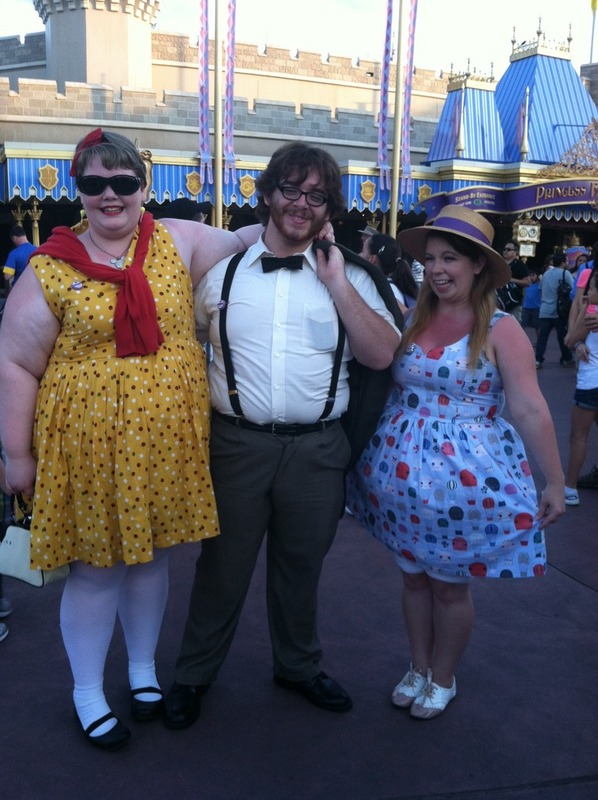 Ah, Disneybounding. One of the best and most controversial trends to pop up in recent years. Personally, I love it, but some people are divided on the topic, since there’s such a wide spectrum of possibilities. 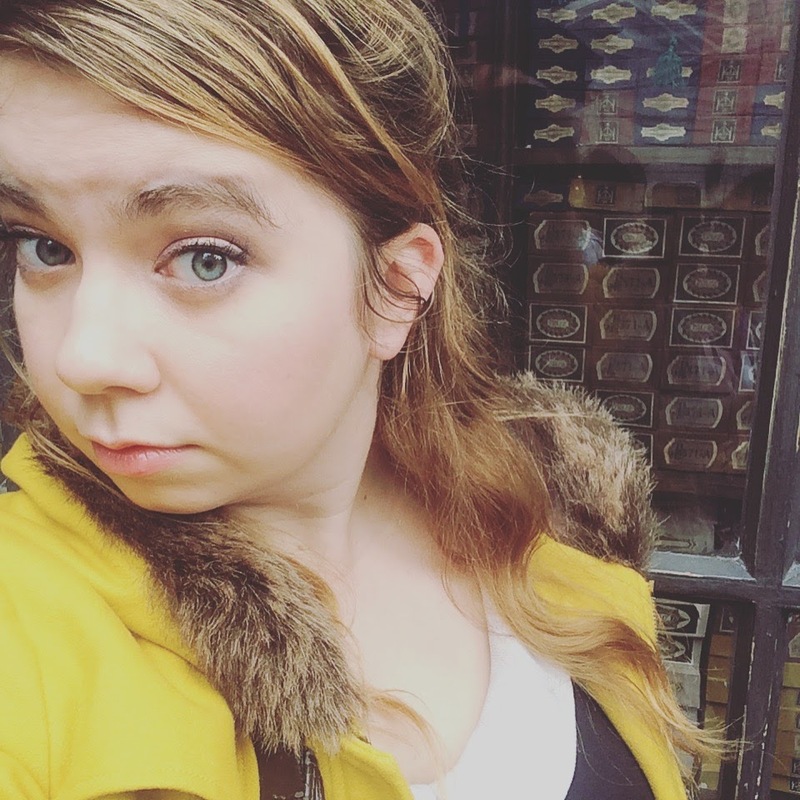 For those who don’t spend all their time in Disney parks and feel a little out of the loop, Disneybounding was created by a blogger named Leslie Kay. 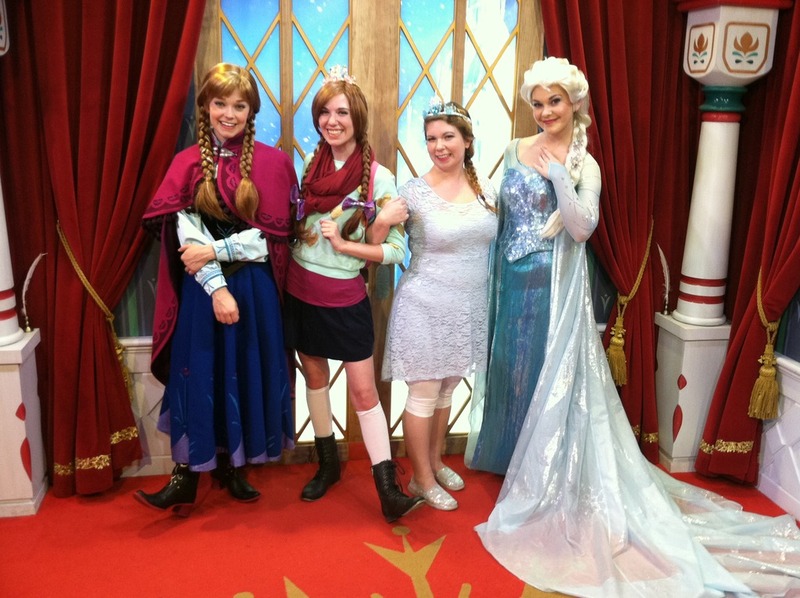 Its a specific style of dressing in a manner influenced by a Disney character, film, or attraction. For instance, if I wear a yellow skirt, a navy top, and a red bow in my hair, I can be fairly identifiable as Snow White. It’s a great way to compromise when you can’t fully dress up to go to the parks. 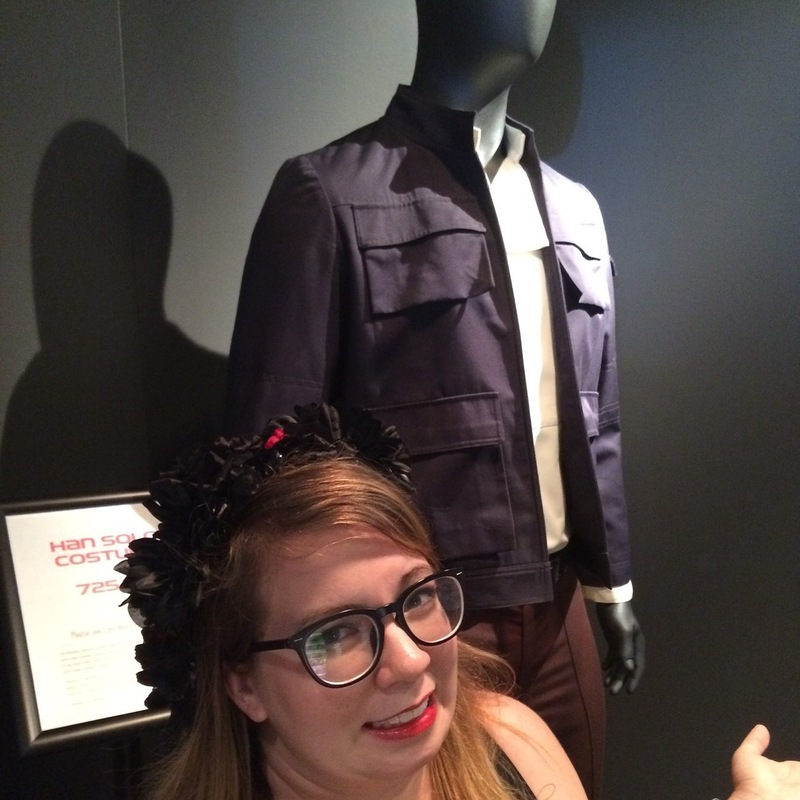 Why can’t you dress up for the parks? That’s a great question! There’s a rule in place that no one over the age of fourteen can dress up for the parks. A lot of people think that’s unfair, but it’s really a great rule. Let’s say that five-year-old Jenny goes to Magic Kingdom for the first time, and she’s so excited to meet Cinderella. So they get to Fairytale Hall, and it’s a forty-five minute wait, and Dad isn’t too excited about that. But wait! A teenage girl in a Cinderella dress is standing outside Fairytale Hall. Close enough! Dad sends little Jenny up there, and Cinderella puts her phone away long enough to take a picture and scribble an autograph. But that’s not the same. It’s not the same at all. And imagine this- if Jenny goes up to “Cinderella” and the princess swears at her and says she’s just trying to have fun and leave her alone. Jenny would be heartbroken, right? Disney magic ruined. So yeah. Save your costumes for Not So Scary, when the party wristband can set you apart from the real characters. Maintain character integrity! So that’s where Disneybounding comes in. 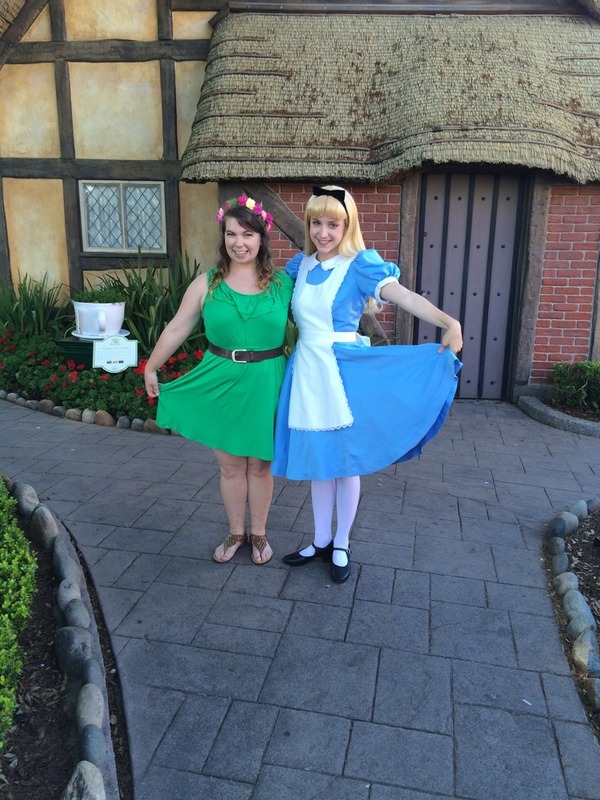 It’s a great way to “dress up” as those beloved characters (or even attractions!) without being in full costume. The best way to do that is to pull from the color schemes of the characters- yellow, navy, and red for Snow; aqua, purple, and red for Ariel; red and white polka dots for Minnie Mouse. You get the idea. A lot can be done with makeup and hairstyles as well, although wigs should be avoided. Not only does that send you into costuming territory, but really, y’all. It’s Florida. It’s swampland. Y’all are gonna sweat to death. Another way to pull inspiration is through accessories. I’ve used a necklace with a gold comb on it for Rapunzel, and a necklace with a thimble on it for Wendy. A lot of Etsy sellers create beautiful bows, custom ears, and themed flower crowns as well that can make you intsagram ready in no time. Some of my favorite shops are Ever After Bowtique, Soundsation Ears, and Magic by Courtney; all three of those shops are run by fabulous ladies who do good work. 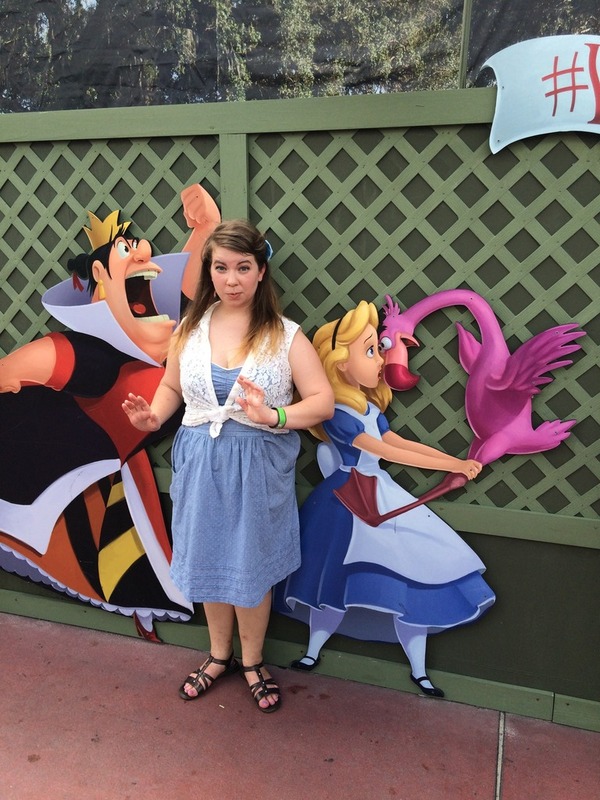 But Caitlin, you say, have you ever Disneybounded? Have I ever! Here’s some examples. I put together a Disneybound pajama outfit for the 24 hour day at Magic Kingdom the one year I went (RIP, but mostly RIP to the cast members who worked all night). 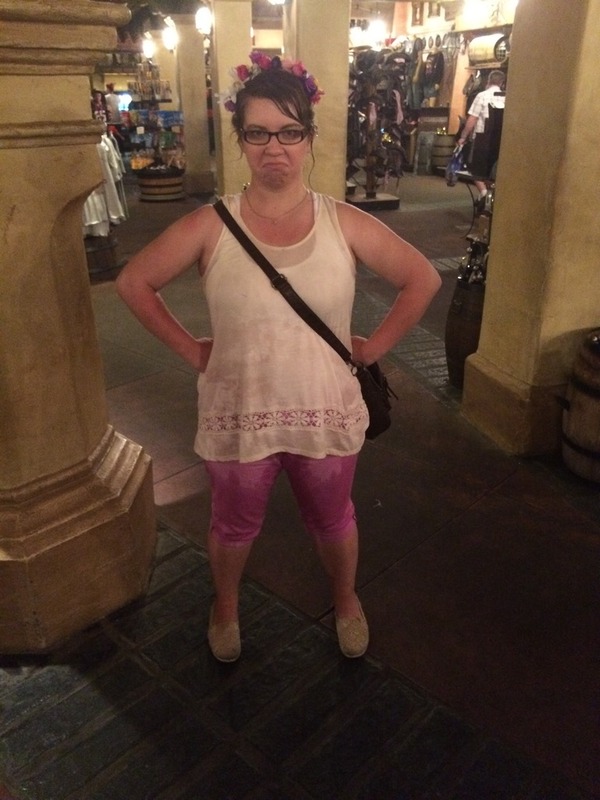 I wore a white tunic from Target, lavender leggings from Walmart, and cream lace shoes from Payless. I made the flower crown myself, and the satchel was a gift from my friend Carrie (Pascal was hers but she lent him to me for the night). Her pajamas bound was even cuter- green plaid pajamas and bear slippers, because she was Merida! 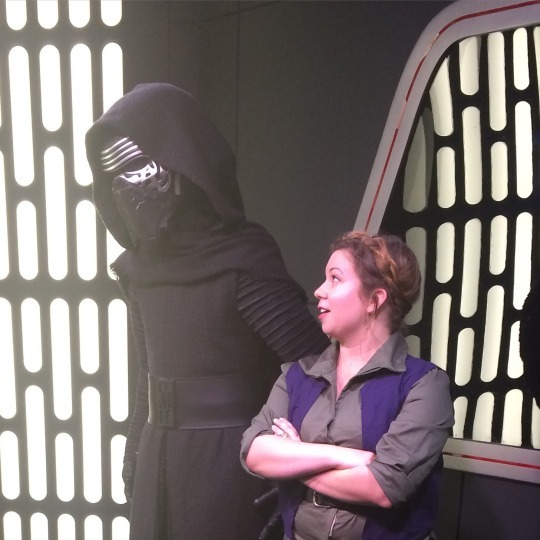 My hipster Kylo Ren disneybound is probably my all time favorite. The dress is one of my faavorite Modcloth purchases, the Bells of London, Ohio dress made by Dear Creatures. 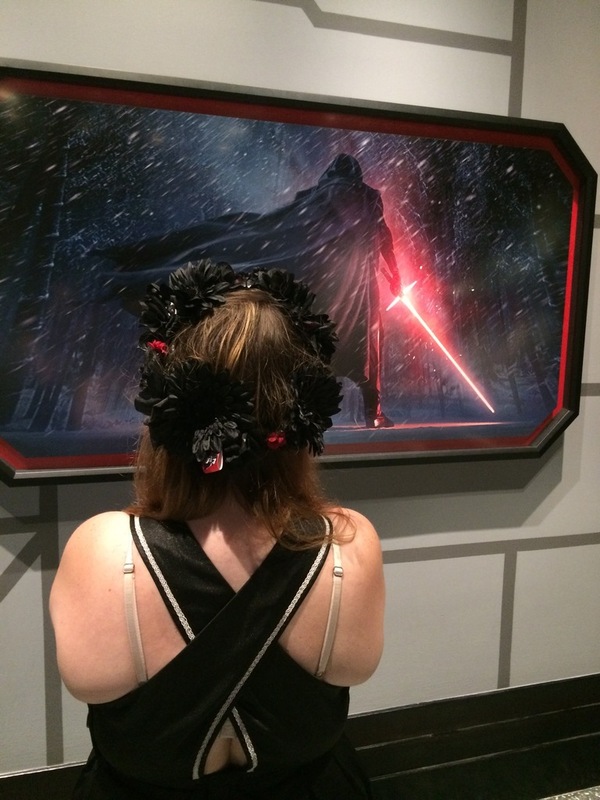 I wore it with black low top converse style shoes and made myself a flower crown- the best part is the hidden Darth Vader. Me: Can you please…can you please write Kyle Lauren on it? So then flash forward to when they’re calling my name. 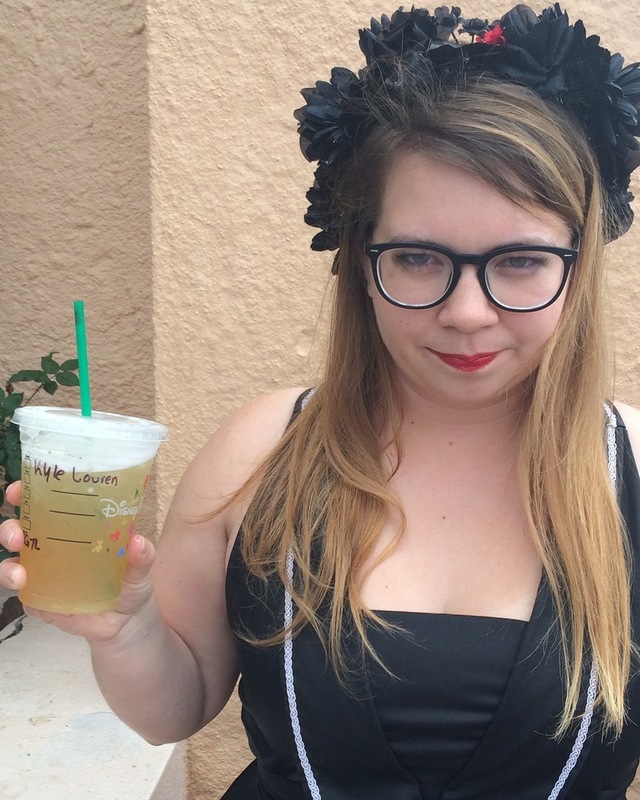 Barista: I have a venti peach green tea lemonade for…Kyle Lauren? There was a dad wearing a Star Wars shirt leaning against the bar. He looked at the cup, then me, then back at the cup, and he started laughing hysterically. “Come on!” he chortled. “Kyle Lauren! 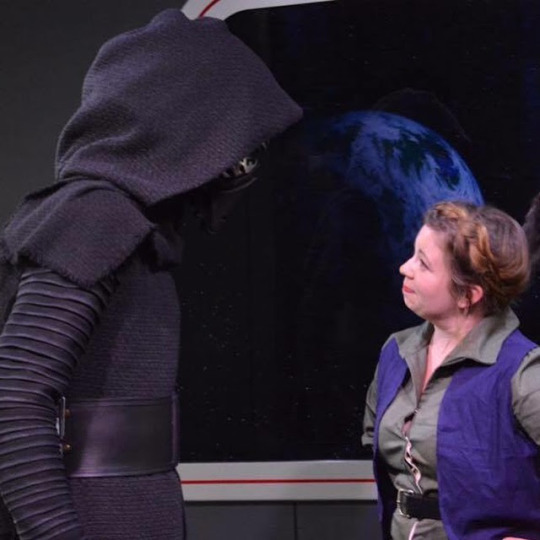 Kylo Ren! It’s so funny!” Thank you, random dad. The barista might have looked at me like I had twelve heads, but I appreciate your laughter. On St. Patrick’s Day a while back a bunch of us met up in our best green disneybounds. 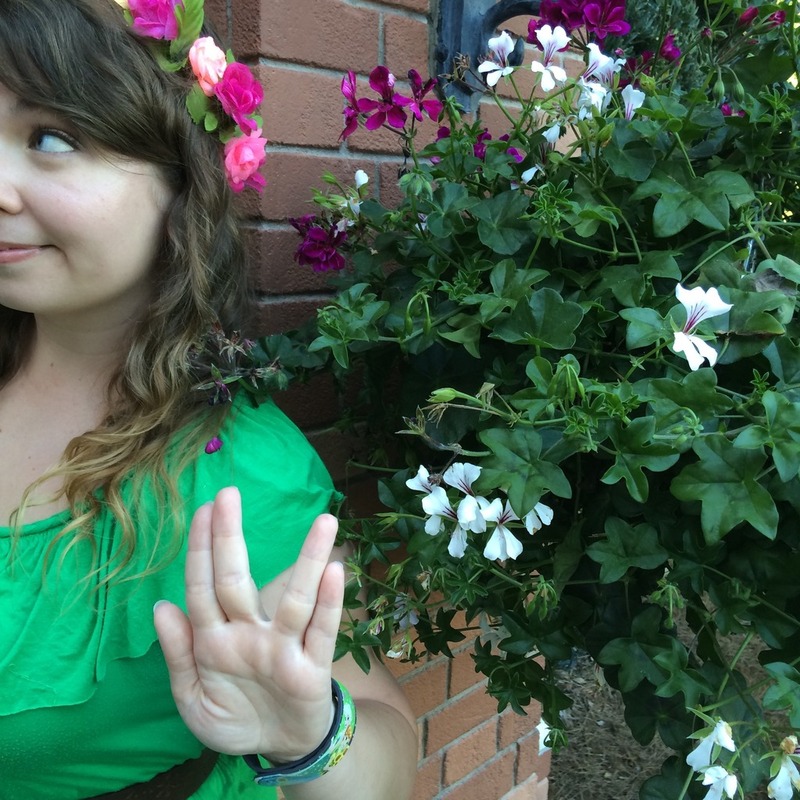 I chose to go as Pascal, so I wore a green dress from Pink Rose, a brown Faded Glory belt, a pair of Nicole sandals from Ross, and a Forever 21 flower crown that had been admittedly rather sparse, but I spruced it up with some extra blooms left over from another project. 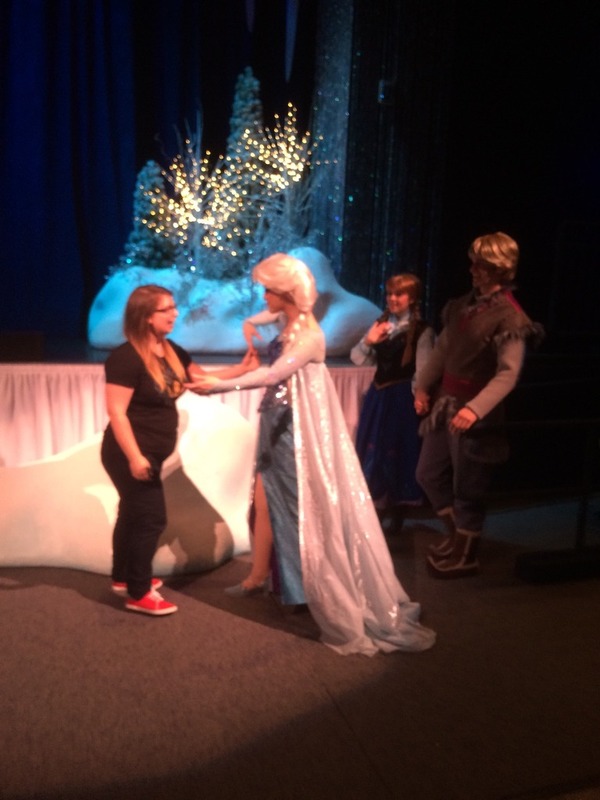 Elsa is always one of my favorite cosplay choices, especially when my sister and I are disneybounding together. 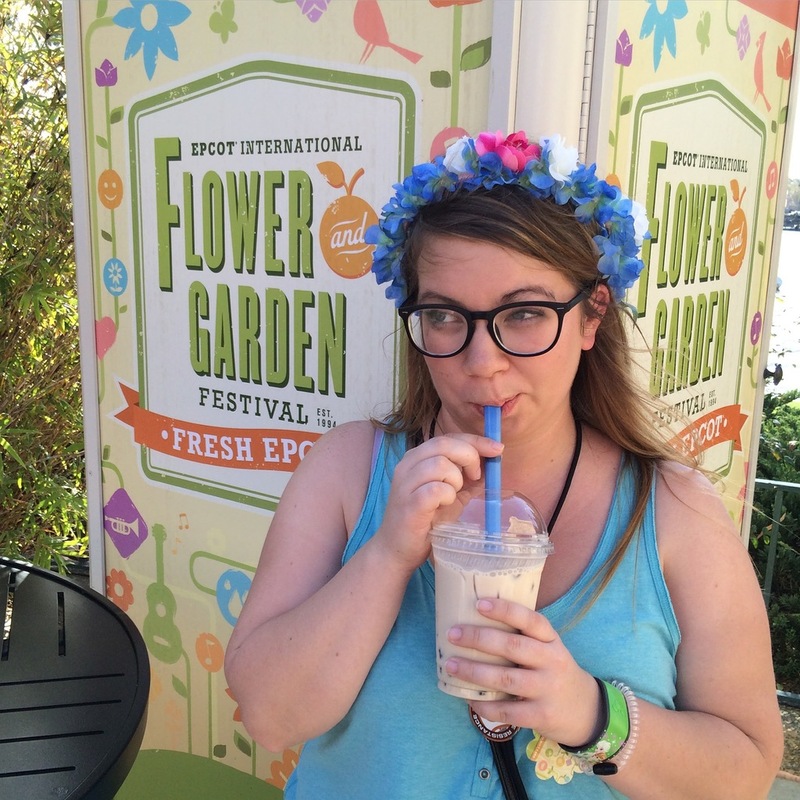 For Frozen Fever Elsa, I wore an aqua tank and white shorts and a flower crown made by my sister. 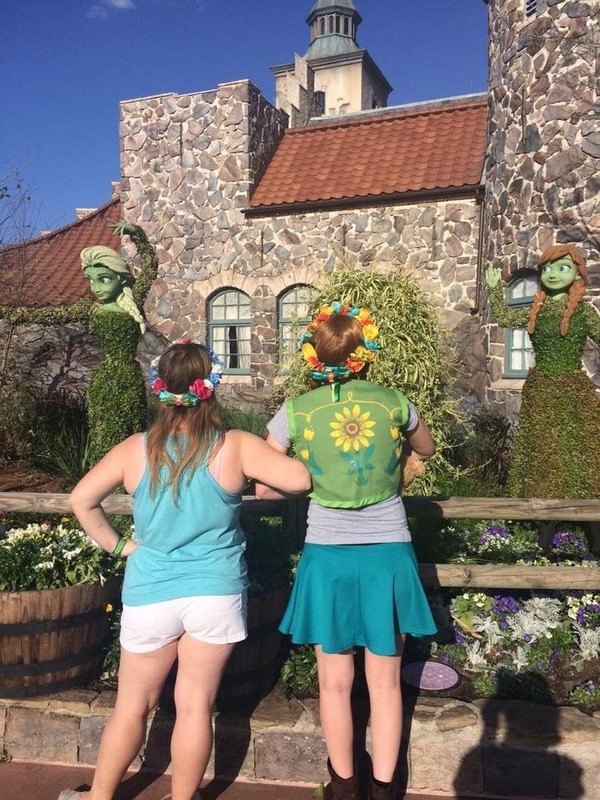 As an extra surprise, she ordered the Frozen Fever bows from our favorite Etsy shop, Ever After Bowtique, and added them to the backs of our crowns. 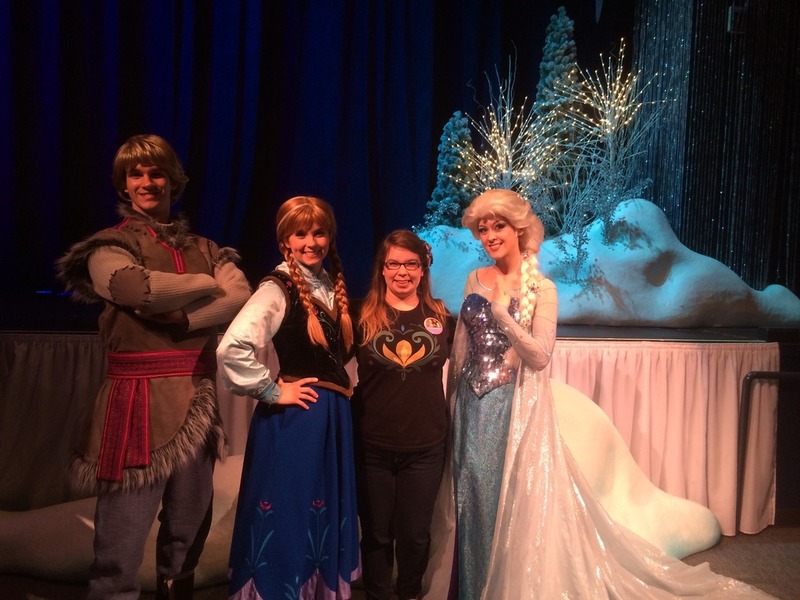 You can also see that Lindsay went a little more intense with her disneybound- she cosplays as Anna and has made three of her outfits so far, so she wore the vest from her Frozen Fever cosplay, but styled it with street clothes. 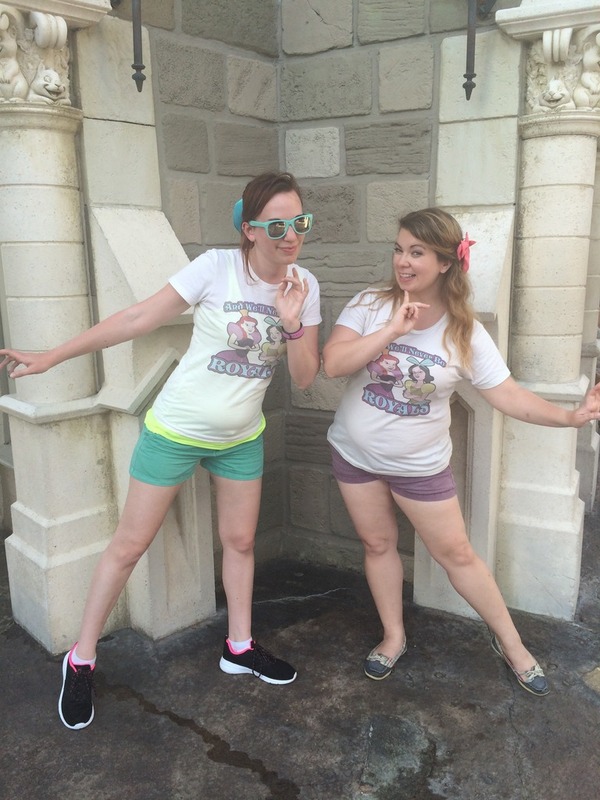 Our first Anna and Elsa Disneybound was a lot more intense. 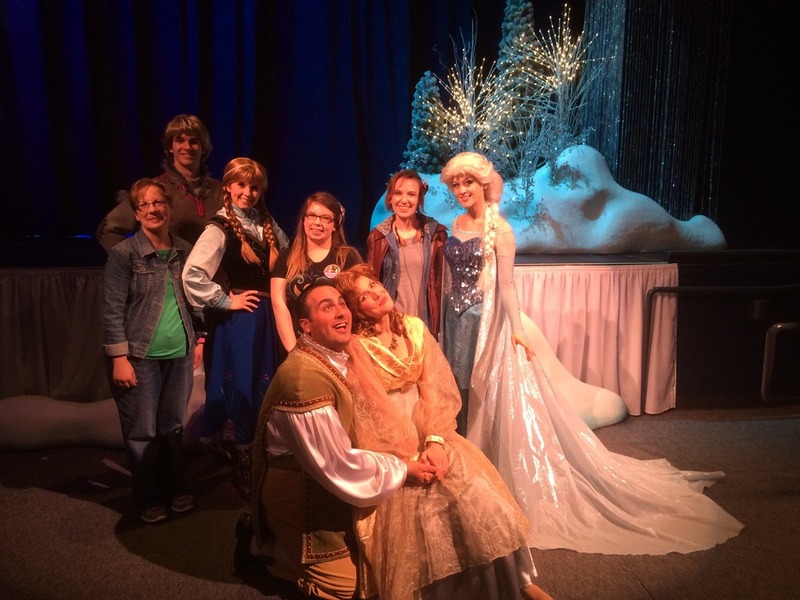 This was when the movie had only been out for a few months and the princesses were at their first meet and greet location in Epcot. Lindsay usually likes to wear wigs, so she wore her Anna wig, but the rest of her outfit was clearly street clothes in Anna-inspired colors, which balances out. I wore a dress from Ross and sparkly shoes, and we both wore the park tiaras. I also styled my hair and makeup to be Elsa-inspired. 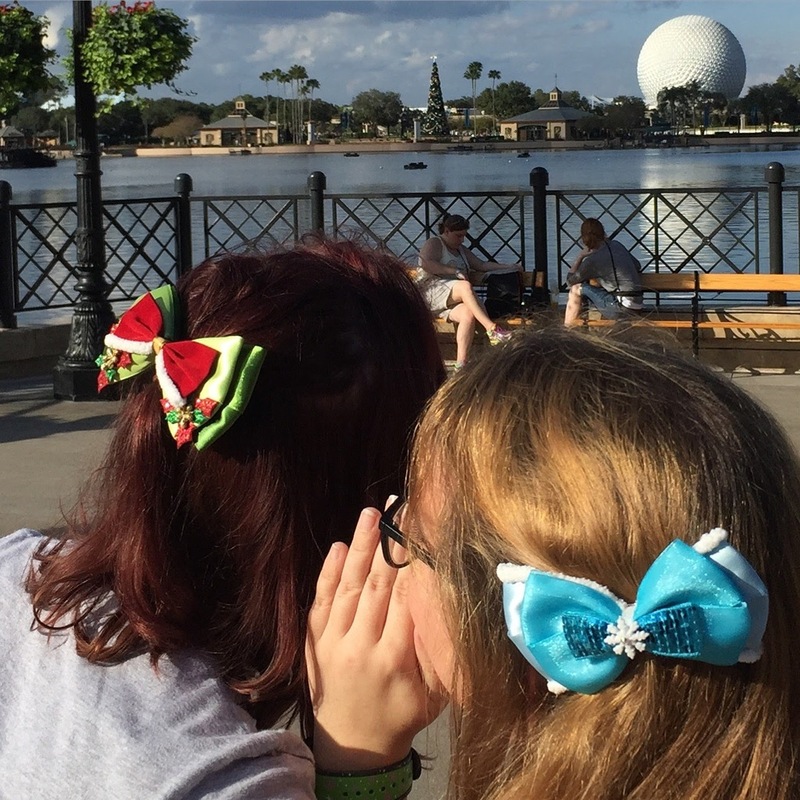 For another example, I custom ordered a beautiful set of holiday Anna and Elsa bows (also from Ever After) for me and my sister. To be super honest, I don’t have any full photos of our outfits and I don’t remember what we wearing, but aren’t these bows cute? Amber custom made them after I had a terrible experience ordering from Caleigh’s Crowns (which has now closed), and not only was she brilliant to work with, she delivered them to us personally in cute holiday gift bags with candy canes! 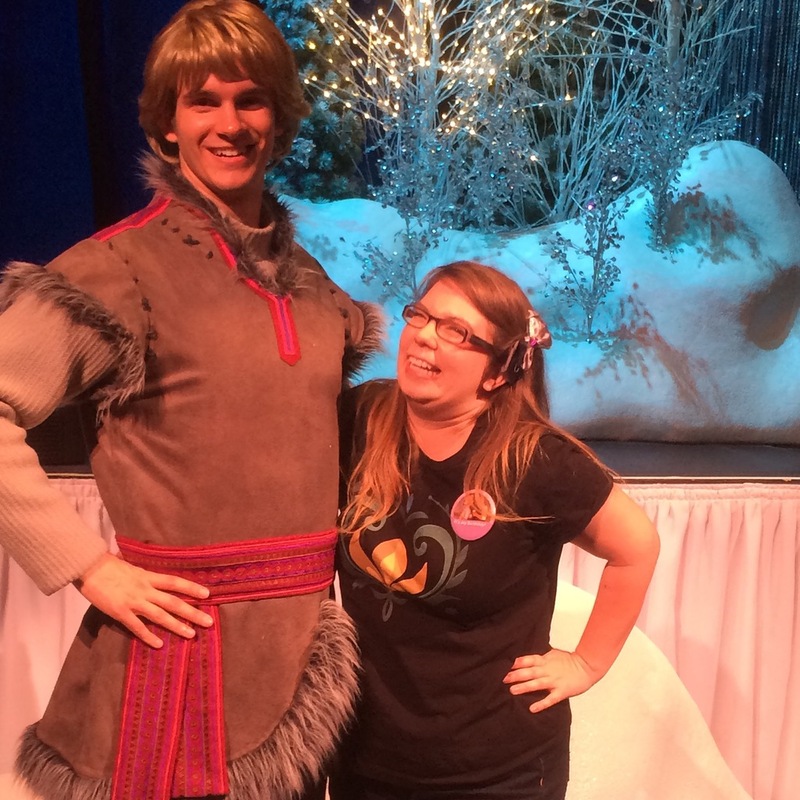 I don’t always disneybound as just Elsa- this was my adorable Kristoff inspired outfit! 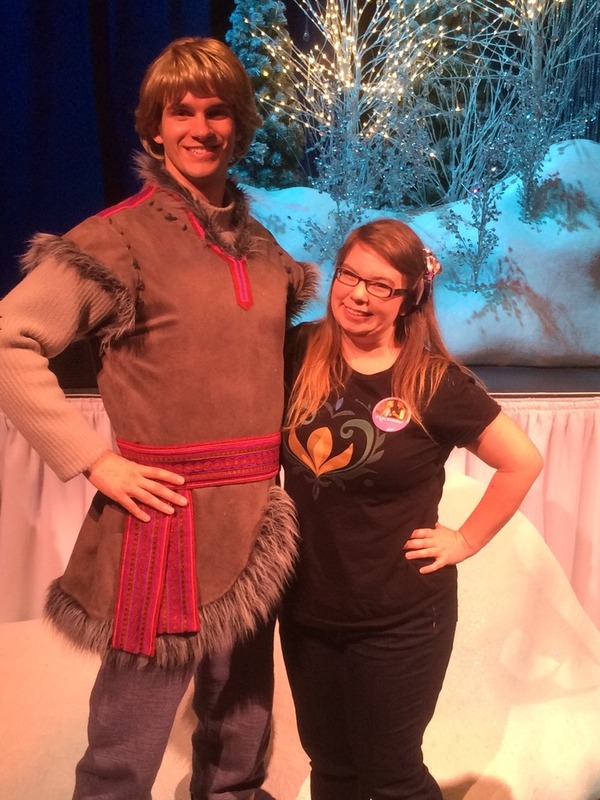 I wore an embroidered peasant top and a gray skirt, both from Forever 21, navy leggings, my black Hamish boots from Blowfish, and my Kristoff bow from Ever After Bowtique. 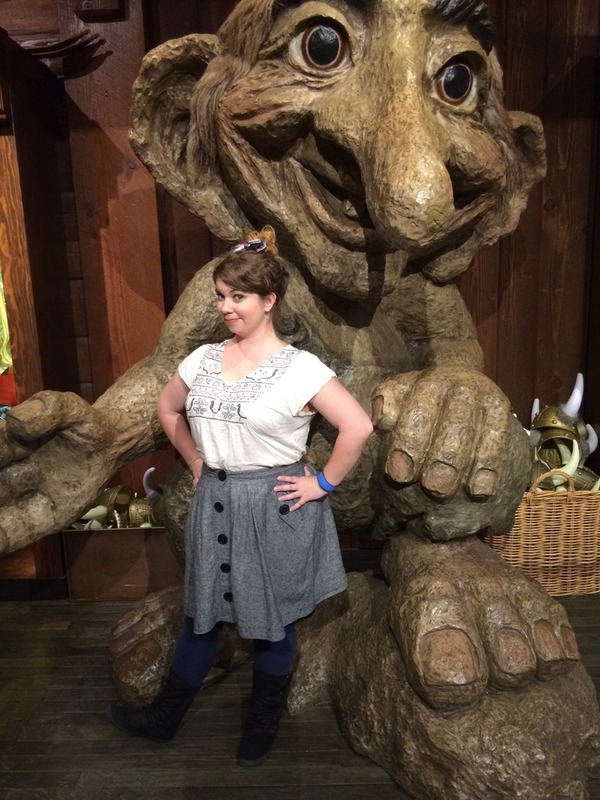 And of course I posed with a troll. I think that’s like a rule or something. This is a sweet and simple Alice in Wonderland disneybound- a blue dress from Target, a white lace top from Forever 21, a blue bow from Ever After Bowtique, and my trusty iCarly sandals. It was cute, comfortable, and just identifiable enough. 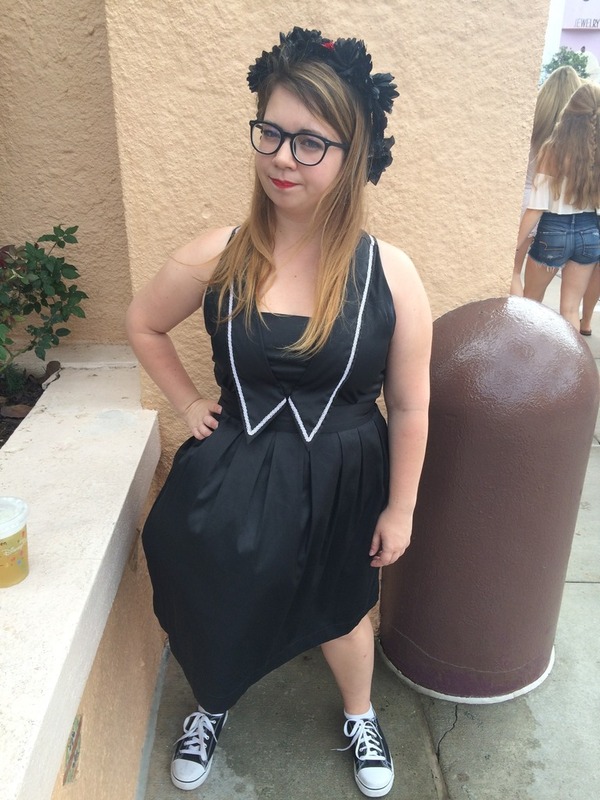 Dapper Day is another great opportunity for subtle disneybounds! 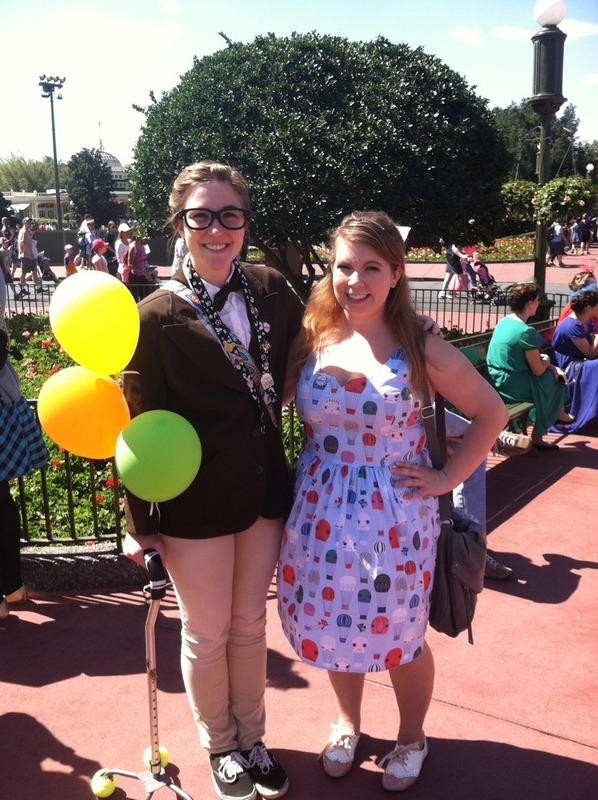 I’ve documented my Queen of Hearts, Queen Elinor, Rapunzel, and Wendy themed outfits before, but my very first one was a simple disneybound of the house from Up. I wore the Air of Adorable dress from Modcloth with the same Modcloth oxfords I wore for Rapunzel, plus a small petticoat, the Grape Soda pin, and a borrowed vintage hat. It was subtle, but effective. 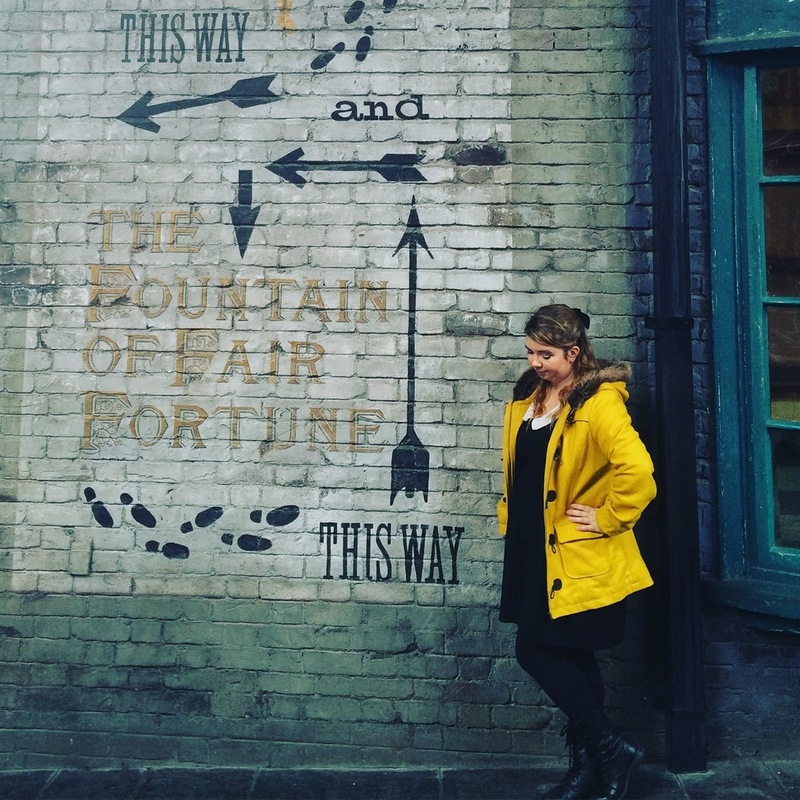 What are some of your favorite Disneybounds? 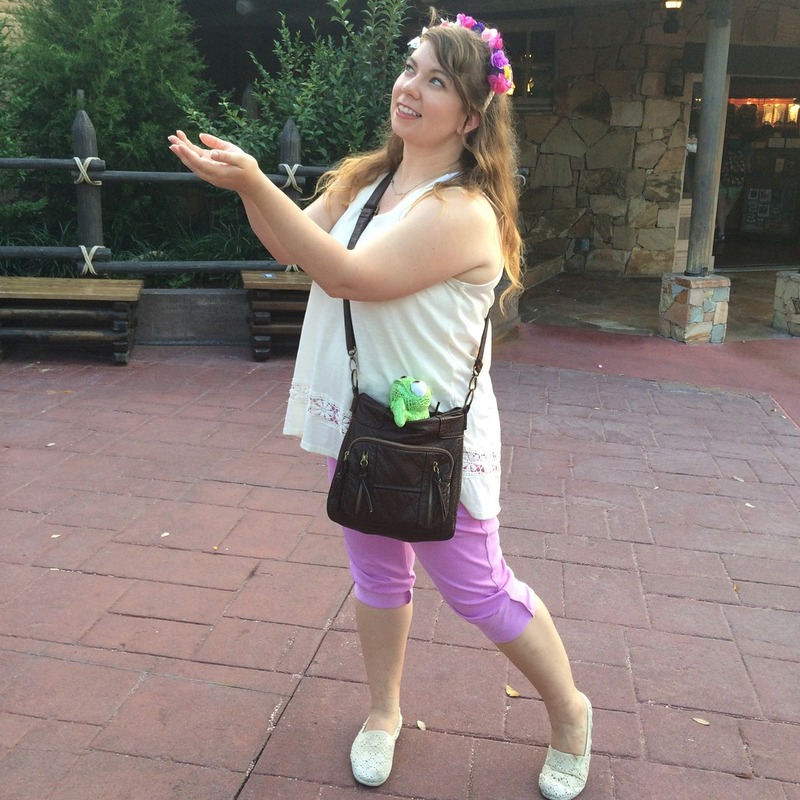 Do you have any tips, tricks, or rules for disneybounding? 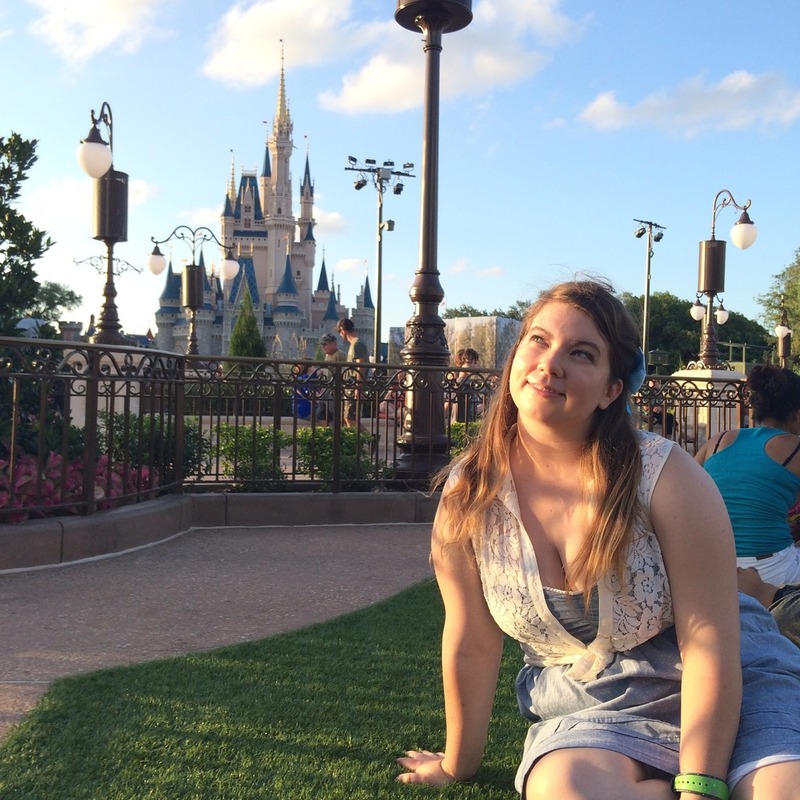 Comment below if you want to see a follow up blog or video about disneynounds, and maybe you’ll be featured!